Biggin Hill probably takes its name from a hilltop ‘bigging’ or habit­ation and was first recorded – as Byggunhull – in 1499. The modern spelling of the name made its first appearance on a map drawn c.1762. It has been said that the settlement of Biggin Hill “started almost in the middle of nowhere, and then grew.” This process commenced when the Wandsworth specu­lator Frederick Dougal bought the manor of Aperfield at auction in 1895 and began selling off the land in parcels, prompting a brief flurry of house­building activity. Growth proceeded at a slower pace after Dougal’s death in 1905, but by the outbreak of the Second World War the township was well developed and there was little further construction for nearly two decades. Biggin Hill occupies an important place in British history as a military airfield, famil­iarly known as ‘Biggin-on-the-Bump’ or simply ‘Biggin’. In the Second World War it became a Spitfire station and was attacked a dozen times during the Battle of Britain. Offensive missions flew from here after the pressure for defensive action was relieved. During the 1950s the church of All Saints, Peckham, was brought here brick by brick and re-erected as St Mark’s, which is accord­ingly nicknamed ‘the moving church’. When the Macmillan government decreed that every borough should undertake a programme of council house building, the reluctant Bromley seized upon this remote corner of its fiefdom as a suitable place to fulfil its oblig­a­tions. Private builders, too, put up houses and flats wherever land could be acquired, prompting Nikolaus Pevsner’s comment that it is “a place to make even the most ardent free-enter­priser admit the virtues of planning.” Many houses are sited on the hillsides, resulting in split-level layouts with steep gardens. The locality’s inaccess­ib­ility has tended to make this a relat­ively affordable place to live. Biggin Hill airfield was downgraded to non-opera­tional status in 1958 and the RAF finally left in 1980. When Croydon Airport closed, most of the operators who had not already made the move came across to Biggin Hill, which is now the most popular light aviation centre in southern England. 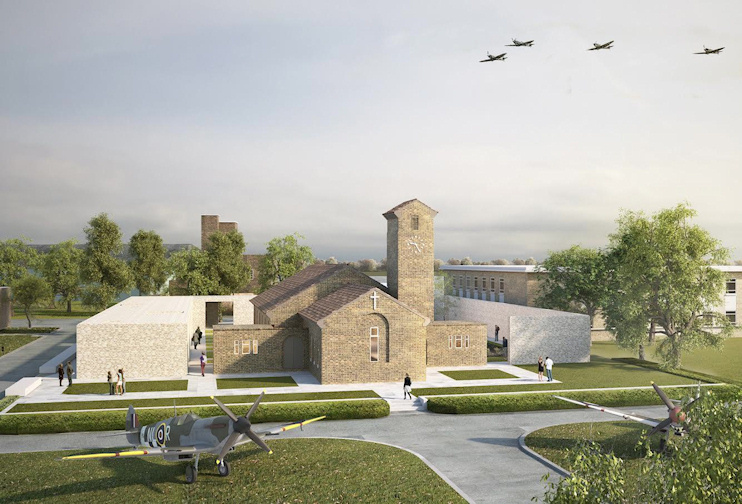 Shown in the CGI at the top of this article, Biggin Hill memorial museum opened beside St George’s RAF chapel of remem­brance on 30 January 2019. A second phase, in the form of a ‘learning space’ and memorial wall, will be constructed when and if funding permits. The museum’s design has not been widely acclaimed, to put it mildly, but Hidden London admires its restrained simplicity, which allows the chapel to take centre stage. Reviews of the museum on TripAdvisor have been mixed, though mostly positive. Pre-booked tours of the nearby (but uncon­nected) Biggin Hill Heritage Hangar are much more highly rated.